Our latest research report, commissioned in partnership with Beauhurst, responds to the recent Patient Capital Review consultation and explores whether there is a UK ambition gap. 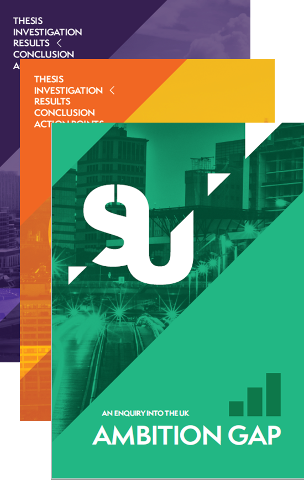 We encourage you to download the report, featuring results based on surveys with 100 UK entrepreneurs, 10 leading UK tech founders and 5 active venture capital partners. An error occured when submitting your request to download the research paper. Please try again. An email has been sent to with details on how to access the report. The Scale Up Series | Ambition, hosted in partnership with Coutts, explored how the UK can create an environment that will nurture unicorn businesses, and ensure their founders have the ambition to break through. The evening further explored the VentureFounders research project which set out with a thesis to explore if the UK has an ambition gap against the US. • Do UK founders look to sell their businesses too soon? • Is this a symptom of a lack of ambition in the marketplace? • How can the UK ensure that the next world-beating business is founded here? VentureFounders Scale Up Series | Talent, took place on Thursday 25 May at The Bulgari Hotel in Knightsbridge. In partnership with Metro Bank, this second instalment of the Scale Up Series gathered founders, investors, and tech leaders to help break down one of the biggest barriers to scale-up growth: the sourcing and retention of world-class talent. Generalist vs specialist: What kind of talent do scaling businesses need? VentureFounders and Microsoft Accelerator came together to host the Scale-Up Series: Pitch Off at the Courthouse Hotel, Shoreditch. This marked the launch of VentureFounders', Scale-Up Series of events that will run into 2017, offering investors a real insight into the challenges faced by great British businesses scaling their business. The event brought together some of the best names in the scale-up ecosystem, including former CEO of Dyson and VentureFounders Chairman Martin McCourt, who delivered the keynote speech. The event also included a panel featuring Irene Graham from the ScaleUp Institute and the whole evening was compered by Michael Hayman MBE. November's Member in the Spotlight - an interview with James Codling - investing in disruptors. At our recent Scale Up Series event in May, Emma Cerrone of Freeformers talked about the importance of talent for scale ups. Here she talks more about attracting and retaining talent in your business. At our recent Scale Up Series event in May, Simon Calver of BGF Ventures talked about the importance of focusing on talent at scale up, for success. Here Simon explains the importance of retaining staff through recognition and the development of a positive culture. At our recent Scale Up Series event in May, Simon Calver of BGF Ventures talked about the importance of recognising and retaining talent at scale up, for success. Here Simon tells us his top tips for finding the right talent and the impact technology has on the process. At our recent Scale Up Series event in May, Simon Calver of BGF Ventures talked about the importance of recognising and retaining talent at scale up, for success. Here Simon describes what kind of existing talent a potential investor might be looking for within a scale up business. He explains what talent looks like and how to find it. HypaShip is an end to end software for parcel networks and postal operators to manage their entire business, driving increased revenues, improving service, and reducing operating costs. Farewill is the all-in-one financial and legal services platform for dealing with death. Cydar’s software analyses the live X-ray imaging in operating rooms to determine the position of the patient and gives physicians a real time understanding of 3D and soft tissue anatomy. MedicSpot has developed a hybrid diagnostic solution that is at the crossroad between a physical GP and an online technology platform by using underutilised pharmacy consulting rooms. Zopa was launched in 2005 as the world’s first P2P lending platform and was the first major P2P lender to be fully authorised by the FCA. It has since lent over £3.5bn in unsecured loans, with over 400,000 customers served. Hopster is re-inventing the pre-school TV channels as an interactive, learning experience for tablets, smartphones and connected TVs. In-depth private company data to help businesses grow revenue, streamline onboarding and minimise exposure to risk. Combat Medical sells cancer treatment delivery systems for the bladder and organs within the peritoneal cavity, reducing the recurrence of the disease and the side effects of chemotherapy. Talmix is a marketplace for independent consultants, providing flexible and on demand access to expert talent. Brightpearl is a SaaS-based, multi-channel Enterprise Resource Planning (ERP) platform for small and medium sized businesses. Micrima is aiming to bring about significant improvements in breast cancer screening. Pyreos is one of the world’s only suppliers of thin film pyroelectric sensors. Innovative marketplace platform that is disrupting the rapidly digitizing global outdoor media market. Cipher Surgical is making keyhole surgery (laparoscopy) quicker and safer for both surgeon and patient. idio is helping companies identify content consumption patterns and achieve higher ROI on their content marketing. An easy and powerful way to create employee schedules and rotas for businesses in retail, hospitality, restaurants and healthcare. freemarketFX is an innovative peer-to-peer currency exchange for companies, with focus on high value transactions. Hiring-Hub.com is a disruptive online recruiting platform, connecting employers directly to a network of recruitment agencies. Award winning company that creates make-it-yourself kits and digital tools, which enable children to make, play, code and invent using technology. Revo is an automated liquid solution production system for laboratories, releasing scientific minds from the burden of procedural lab tasks. Samba reinvents advertising for young consumers who are rejecting interruptive, irrelevant and 'stalking' ads. Samba integrates into messaging apps, delivering targeted ad campaigns at a global scale. Lightpoint Medical is an innovative, clinical-stage medical device company that has developed a groundbreaking surgical imaging technology with the potential to detect cancer in real-time during surgery. Scoota (previously Rockabox) is the global leader in programmatic technology for rich media marketing. Zilico manufactures the next generation of cancer diagnostic devices including its flagship product ZedScan™ (cervical cancer). Connexin, an innovative internet phone company that provides cost-effective, high-speed wireless internet and hosted services. EcoHydra Technologies is a company with new ideas; backed up by decades of senior management experience.